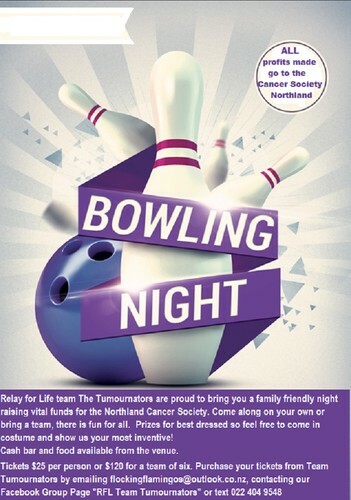 Relay for Life team the Tumournators are proud to bring you a family friendly night where all profits made go to the Cancer Society Northland as part of our Relay for Life fundraising. Come along on your own or bring a team, there is fun for all! Want to be in to win extra prizes - dress up in costume! Tickets are $25 per person or $120 for a team of six. Your ticket price includes shoe hire and two games of 10 pin bowling. (Please bring your own socks or you can hire from the venue for an additional charge). Door Prizes - Raffles - Balloon Fundraiser - Costume Prizes - Bowling Prizes. Food and cash bar available on site (*not included in ticket price). Business sponsorship available - contact us for more information. Proudly supported by Whangarei 10 Pin Bowling.